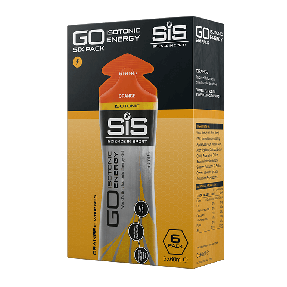 The GO Energy + Caffeine Gel 75mg builds on the established science of the GO Isotonic Energy gel, the world's first and only truly isotonic energy gel. This product provides 22g of carbohydrate and 75mg of caffeine per gel (Citrus flavour). Ideal for high intensity races and long, tough days on the road. Caffeine has been repeatedly shown to improve performance by lowering your perception of effort by providing a boost just when you need it. GO Energy + Caffeine is clean in the mouth and easy to digest. For when you want an energy boost, but want the benefits of caffeine too. Use before or during sport for added physical and mental focus when you want to get an edge. Consume 1 gel 1 hour before exercise for high intensity, short duration events to ensure the body starts with elevated caffeine levels. In longer duration events consume no more than 2 double caffeine gels per day. Ensure you keep hydrated. This product is not intended for children, under 16's or pregnant women. 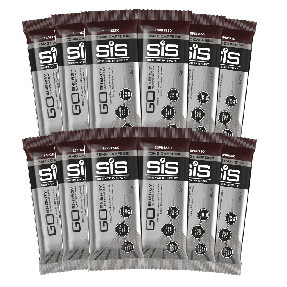 Where hydration is important, SiS GO Energy + Caffeine Gel 150mg can also be consumed with SiS GO Hydro or GO Electrolyte to ensure a combination of energy, caffeine and fluid delivery during exercise. Simply tear off the top of the packaging and consume - there is no need to mix with water. Caffeine acts centrally on the brain to lower the perception of effort, which is particularly noticeable in longer events. In distance events over 90 minutes, mental tiredness as well as physical fatigue plays a large role in determining performance as the event progresses. Caffeine can help to maintain physical performance in this situation. Depleting your carbohydrate stores during exercise is one of the major causes of fatigue. 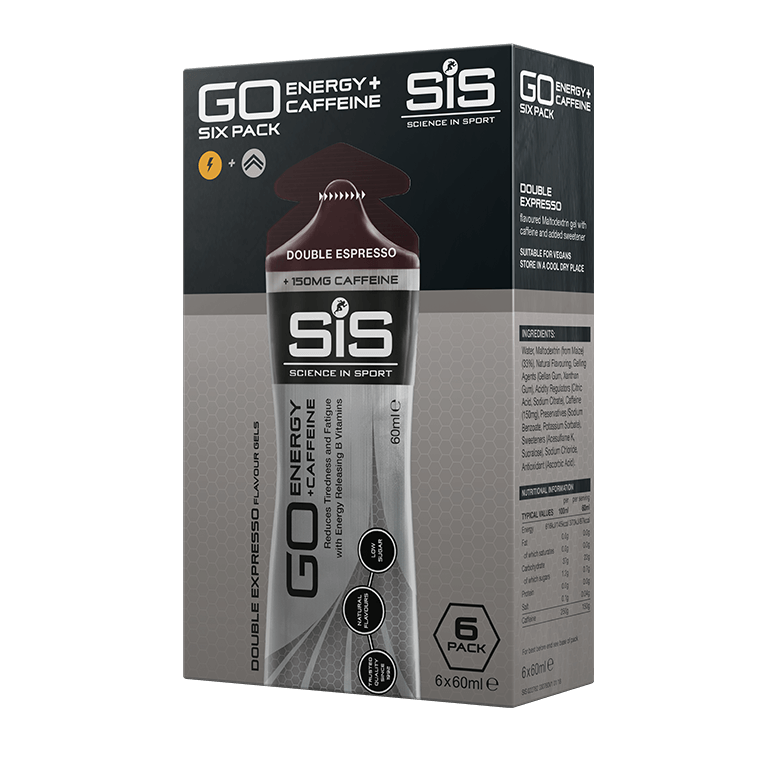 Delivering the additional carbohydrate provided in SiS Energy + Caffeine Gels during exercise can help improve performance, race times and delay the onset of fatigue. For nutritional information about the individual flavours please contact customer service. Example below is for Cola flavour. What is the recommended frequency of consumption? We don't recommend that you consume more than 4 x GO energy + 75mg gels per day. When is the best time to consume the GO Energy + caffeine Gel? Have 1 gel 30 minutes before short, intense exercise to provide mental stimulation for the race ahead. Have 1?2 gels towards the end of long, endurance exercise to improve alertness and concentration. The GO energy + caffeine gel is not isotonic. The added caffeine increases the concentration of the gel. Will these upset my stomach? 75mg of caffeine is the equivalent to one cup of coffee or one can of energy drink. However, individuals tolerate caffeine consumption differently to others, so make sure you try it out in training, before use in competition. Yes! All GO Gels are lightweight, compact and designed to fit in jersey pockets, cycle bags and waist packs. They are pressure tested, so don't worry about the packaging tearing or bursting during exercise. Impossibile fare una gara di endurance senza avere dietro uno di questi prodotti con caffeina. Perfetto! Does a great job at boosting you that extra bit and tastes nice for a gel. Taste could improve a little bit more in my opinion. Similar review to the others i left - great tasting, easy on the stomach and easy to open. Definitely a boost on longer rides - recommended. Found the berry flavour a bit cloying - but it hits the spot. Very good. I love it , a portable espresso. Brilliant Caffeine energy Gel & works brilliant. non disturba lo stomaco ma il gusto è un po' troppo forte. Comunque dato che è un doppio espresso, ci sta. Li sto usando nel mio sport preferito, il ciclismo e sono molto contento. I prodotti SYS sono davvero ottimi. Molto utile a fine di un allenamento o di una gara per avere la botta di energia finale. Dà una carica istantanea. Testato.... top! Ottimo e senza problemi per la digestione. Ottimo prodotto sono i migliori Gli uso sia in gara che in allenamento e la.loro efficacia si fa sentire . Extra energy to finish the face. Definitely a help in the final stage of an event! Actually tastes like cola sweets. Great to swallow. The best, specialità before the start. Good product providing the ooommphff that you need. A good product!! To the final part of mtb races.